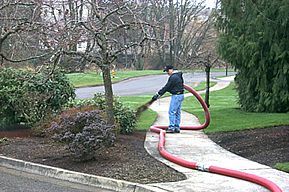 We can apply your landscape mulch quickly and easily, saving you time and painful effort. Well also save you money by using less material overall, spreading your mulch with even distribution. The time and money you save can pay for the cost of application! Put your wheelbarrow away and let Ground Effects take all the "work" out of yard work so you can spend more time doing what YOU want to do!